George W. Bush: Prefers strict constructionists, like overturning Dred Scott. George W. Bush: Not going to spend taxpayers� money on abortion. George W. Bush: First president to fund embryonic stem cell research. George W. Bush: Kerry voted no on partial-birth abortion ban. John Kerry: Bush allows the destruction of life up to a certain amount. John Kerry: Against partial-birth abortion but there are exceptions. John Kerry: Embryos used in stem cell research are not from abortions. John Kerry: Supreme Court justices should be able to make good decisions. John Kerry: We cannot force people to share our faith. George W. Bush: Kerry is not credible as a fiscal conservative. George W. Bush: Haven�t vetoed any spending bills because we work together. George W. Bush: Kerry will not be able to pay for $2.2T in new spending. John Kerry: Bush�s $2.2T figures are put together by a biased group. John Kerry: Bush has driven up the biggest deficits in US history. John Kerry: Restore pay-as-you-go rule that Bush broke. George W. Bush: Patriot Act does not water down civil liberties. John Kerry: The Patriot Act has been used to abuse people�s rights. George W. Bush: FactCheck: Bush indeed is half-owner of timber company. George W. Bush: FactCheck: Kerry plan affects 471,000 companies, not 900,000. George W. Bush: Kerry will tax small businesses. John Kerry: 96% of small businesses not affected by my tax plan. John Kerry: FactCheck: Bush never promised to fully fund NCLB. John Kerry: Fully fund No Child Left Behind. George W. Bush: The Kyoto Treaty would have cost America a lot of jobs. John Kerry: The Kyoto Treaty was flawed but could be fixed. George W. Bush: Proposed different measures to improve the environment. John Kerry: The Clear Skies bill is Orwellian and makes things worse. George W. Bush: Allies are dealing with Iran and North Korea with America. George W. Bush: Other nations are sacrificing with us. George W. Bush: Made unpopular decisions for great American values. John Kerry: Missouri would be the third largest country in �coalition�. George W. Bush: FactCheck: Only 19% of poor seniors use Drug Discount cards. George W. Bush: FactCheck: Frivolous lawsuits do not cost government $28B. George W. Bush: FactCheck: Kerry�s plan doesn�t put bureaucrats in control. John Kerry: FactCheck: Bush�s plan yields $13B for big pharma, not $139B. John Kerry: FactCheck: Kerry�s plan covers 92%, not 100% of Americans. George W. Bush: We got Medicare reform done. George W. Bush: Double the NIH budget to $28 billion. George W. Bush: Make sure the drugs from Canada cure and don�t kill you. George W. Bush: Kerry�s healthcare plan will ruin the quality of healthcare. John Kerry: Choose your doctor and your healthcare plan. John Kerry: Bush said in 2000 that re-importation from Canada was OK.
John Kerry: Lawsuits contribute less than 1% of all healthcare costs. John Kerry: Bush chose a tax cut over health care. George W. Bush: We�ve tripled the homeland security budget. George W. Bush: We are not going to have a draft. John Kerry: Military is overextended and there�s a backdoor draft. John Kerry: Need the best intelligence and cooperation to make us safe. John Kerry: Our container ports, bridges, & plants are not secure. John Kerry: FactCheck: 0.6M jobs lost under Bush, not 1.6M. George W. Bush: To keep jobs in US, develop energy and keep taxes low. John Kerry: End tax incentives for companies to move jobs abroad. John Kerry: Can�t stop all outsourcing, but can level the playing field. George W. Bush: Iraqi war and tax cuts were not mistakes. George W. Bush: Cut taxes on everybody. John Kerry: Enron received $254 million after the Bush tax cut. John Kerry: More tax cut for all people earning less than the $200,000. John Kerry: Pledges not to raise taxes on earnings under $200,000. John Kerry: FactCheck: Shinseki retirement was pushed but not forced. George W. Bush: Bush rejected NATO�s suggestion to help training in Iraq. George W. Bush: Sent a $87 billion bill that gives troops equipment. George W. Bush: The war on terror includes invading Iraq. George W. Bush: Saddam was a unique threat because of the potential WMD. George W. Bush: Saddam wanted to restart his weapons programs. George W. Bush: UN sanctions were not effective at removing Saddam. George W. Bush: Other nations will not risk troops in a war called a mistake. George W. Bush: Had the right plan with the right troops level invading Iraq. John Kerry: Would have given Clinton the power to use force if necessary. John Kerry: UN sanctions were to remove the WMD, not Saddam. John Kerry: The right war was Osama bin Laden and Afghanistan. John Kerry: Bush�s job was to win the peace, not just the war. John Kerry: The $87 billion bill gives a slush fund to Halliburton. John Kerry: Iraqi war is a catastrophic mistake. John Kerry: Bush rushed to war without having a plan to win the peace. John Kerry: Reach out to our allies to deal with the chaos in Iraq. John Kerry: We have trained many and are spending a lot in Iraq. 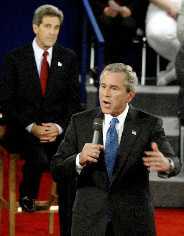 The above quotations are from Second Bush-Kerry debate, Town Hall format, Oct. 8, 2004 in St. Louis, Missouri.